I was finishing up the dinner dishes as the boys ran through the house playing. Me: “It’s time to upstairs and get your pj’s on!” Boys: Running, playing. Me: “Go upstairs and start getting ready for bed!” Boys: Running, playing. Me: “BOYS! Seriously! Go upstairs and get your pajamas on!” Boys: Running, playing. Clearly we were needing a bedtime makeover. It’s been getting worse. And worse. I needed something new. Something drastic. 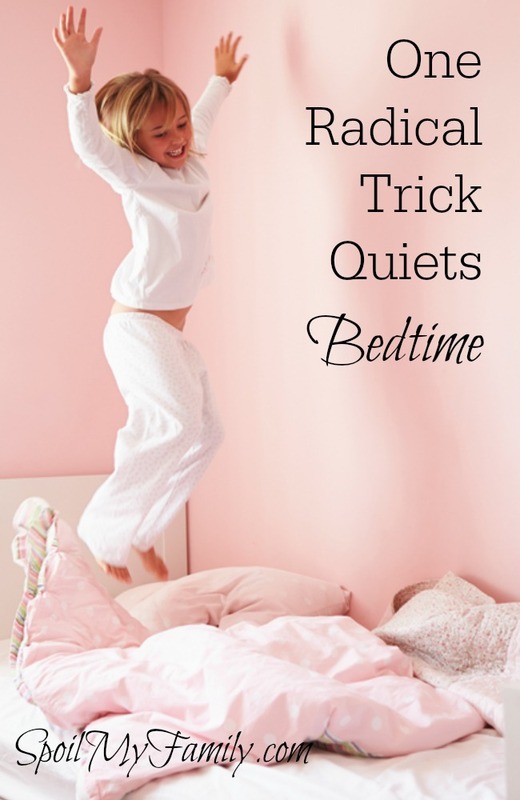 Here’s the drastic, radical, new bedtime solution that actually worked for us. I can’t believe it worked and I can’t believe I’m telling you this! This post has taken me forever to write. And not for the usual reasons – not for any reasons that you might think. Our bedtime routine has been spiraling downward for a while. I was beginning to feel lost, frustrated, and downright angry when bedtime came. We’re lucky – bedtime at our house has always been pretty easy – and certainly no more difficult than most. We’ve had a bedtime routine and we stick to it. Like salmon swimming upstream no matter the odds. We stick to the routine. Like gorilla glue. But seven and half years in… the bedtime routine isn’t working anymore. Our bedtime routine has never been chaotic. And yet here I was…beginning to feel lost, frustrated, and downright angry at bedtime. The boys are running around, jumping on the beds, not listening (or even hearing for that matter…), getting whinny about every little thing and fighting with one another… Basically just being uncooperative. And before I can handle one thing, they’re on to the next. It leaves my head spinning and it makes me one pretty angry mommy. Angry and bedtime is not a combination destined to produce the result I’m looking for. And because I didn’t have any answers or suggestions to offer you, I couldn’t write this post. In fact, I’ve been scouring the internet to try to find my own solutions to the bedtime dilemma so I could share some great wisdom with you. I’ve been looking for something unlike anything I’d ever seen before. Definitely something different than – have a routine, read stories, take a relaxing bath, etc. We do those things. Like a religion. We do those things. But then they just stopped working. So now what? And then it happened. I gave up. I just completely gave up. There was no hope on the internet… My friends were all having the same problem, or no problems at all. (Or possibly they were just lying…) And I had nothing. Nada. Zippo. Zilch. So I gave up one night. I wasn’t angry. I just decided that things had been so chaotic and bedtime was chaotic and then late…I may as well stop worrying about how much sleep they were going to miss tonight. If you can’t beat ’em, join ’em – right? I promised the little one hot chocolate for dessert. It was a chilly evening and we had a fire going. I thought it would be sweet if we all snuggled in front of the fire, drank hot chocolate and I would read a story to them. But I made sure that they understood this was their bedtime story. While I made the hot chocolate, I asked them to go to the bedroom and get dressed for bed. They shouted “On our way!” and raced up the stairs. They changed into pajamas and ran back downstairs. We did it. In that perfect – quick, take a picture of us right now! – sort of way. We nestled together on the sofa sipping hot chocolate in front of the fire while reading an awesome bedtime story. We went upstairs and the boys went to bed with no complaints. It was like their long wait to exhale had just ended. In giving up, I stumbled upon this great kernel of truth that actually worked!! Every once in a while, it pays to shake things up. The routine is the routine. But I think my boys started to feel that they were cogs in a routine wheel. So I definitely haven’t forsaken our bedtime routine by any stretch of the imagination, but now we vary the routine once in a while. For example, the other night instead of just reading a story, I decided I would tell the boys a story. They always groan like they hate this. But then I ask what each boy would like to hear a story about. I usually get something like “the evil LEGO overlord” from my oldest and “a crane” from my youngest. Then I use both ideas and create one big wacky story. They usually giggle like crazy because the different choices naturally lend themselves to silly stories. Tonight, maybe I’ll tell stories with LEGO guys. That has to be a hit, right? So shaking up the bedtime routine was REALLY hard for me. I live by the routine. The bedtime routine has been in place and it worked for so long. But it needed shaking up. And doing things a little differently every once in a while lets the boys know that I am still paying attention. Maybe, just maybe, this break in the routine helped to make them feel that they were more than just part of a tired, worn out routine. They were special and what they needed mattered more than the bedtime routine. Both of my boys LOVE books and (unless I’m telling the wacky story of the evil LEGO overlord who required that the most super big huge crane in the world be constructed to build him a new castle filled with cookies…) we will never give up books for bedtime. Here are some of our very favorite bedtime books. They are all beautifully illustrated and a lot of our favorites that I’ve included below are story collections – so you get many stories in one book! The other thing that the boys would never let me go without at bedtime is our essential oils. Our favorites at bedtime are definitely Lavender and Cedarwood. Here are our favorite oils that we use for many things every day!